Iran’s national basketball team defeated the Philippines 85-71 to become Asia’s champion. The Iranian team won all their nine games in the tournament, defeating South Korea, China, India, Bahrain, Kazakhstan, Jordan, Taiwan and the Philippines, to claim the championship. Iran along with South Korea and the Philippines qualified for the 2014 FIBA Basketball World Cup in Spain. 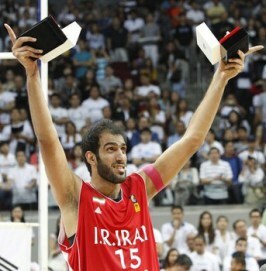 UPDATE: Hamed Haddadi (pictured), a member of the Iranian championship team, was named the most valuable player of FIBA Asia.